Italy plans to transfer some migrants crammed aboard a charity boat onto other vessels and then sail them all to Spain, despite appeals from humanitarian groups to let the group land immediately. Italy plans to transfer some migrants crammed aboard a charity boat onto other vessels on Tuesday and then sail them all to Spain, despite criticism from France and appeals from humanitarian groups to let the group land immediately. Italy's coast guard said in a statement that two Italian ships would take on board some of the migrants, easing conditions on the overcrowded Aquarius. 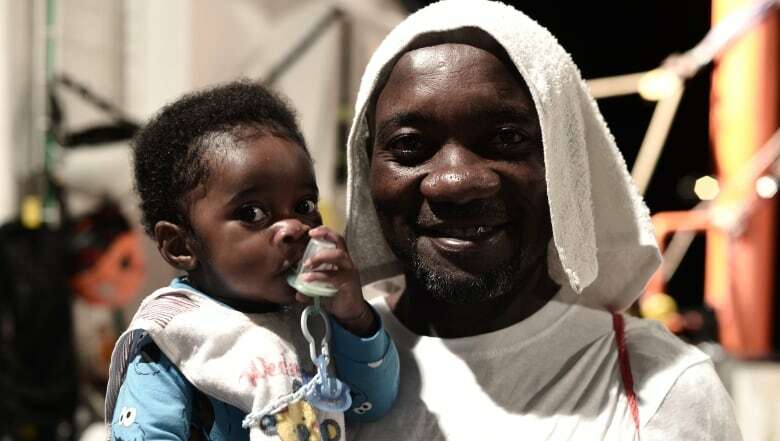 The three ships set sail for Valencia about 9 p.m. local time, on a voyage expected to take four days, according to a spokesperson for the Franco-German charity SOS Mediterranée, which is operating the Aquarius. 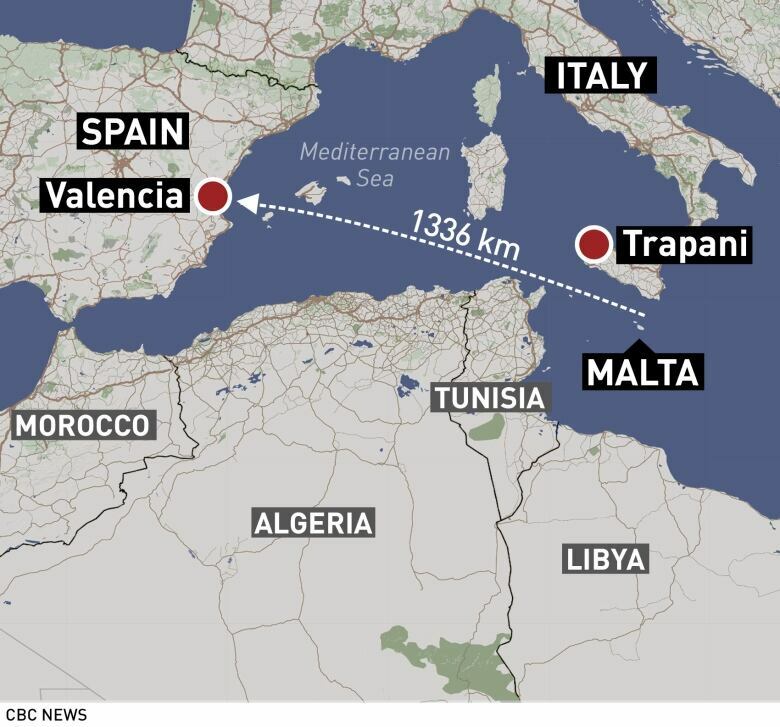 The Aquarius had been languishing in the waters halfway between Malta and Sicily since Saturday. Médecins Sans Frontières (MSF), also known as Doctors Without Borders, which is operating the Aquarius alongside SOS Mediterranée, said via Twitter it would be better if the migrants were allowed to disembark temporarily at the nearest port. But Italy's new anti-establishment government, looking to put pressure on the European Union to rewrite its immigration rules, showed no signs of relenting despite warnings of an approaching storm bringing waves of over two metres. The Italian coast guard said it had contacted countries that are responsible for the waters the Aquarius convoy will cross to ensure authorities are on alert if there were any possible medical emergencies among the migrants that require outside intervention. French President Emmanuel Macron denounced the decision to block the Aquarius, saying that under international law Italy should have taken the migrants in. "There is a degree of cynicism and irresponsibility in the Italian government's behaviour with regards to this dramatic humanitarian situation," government spokesman Benjamin Griveaux quoted Macron as telling his cabinet. But Rome's move was supported by Hungary's right-wing Prime Minister Viktor Orban, who is known for his fiercely anti-immigrant rhetoric. "Willpower has returned to Italy," Orban told reporters in Budapest. It. Coast Guard ship CP941 will disembark 937 people in Italy: this is good, as <a href="https://twitter.com/hashtag/searescueisnotacrime?src=hash&amp;ref_src=twsrc%5Etfw">#searescueisnotacrime</a>. But why do 629 people on <a href="https://twitter.com/hashtag/Aquarius?src=hash&amp;ref_src=twsrc%5Etfw">#Aquarius</a> still have to suffer? NGOs do nothing differently to the Coast Guard. All a political stunt by <a href="https://twitter.com/hashtag/Salvini?src=hash&amp;ref_src=twsrc%5Etfw">#Salvini</a> at the expense of people in distress? "To politely raise one's voice pays off," Salvini said on Monday. "It's something Italy hasn't done for many years." Spain's deputy prime minister said on Tuesday her country agreed to take the migrants because it was impossible to just stand by and do nothing. Carmen Calvo said Spain is meeting its international obligations and sending a message that it is not possible to "remain impassive" during a humanitarian crisis. The issue has quickly turned into a banner policy for Spain's new centre-left Socialist government, which took office last week. 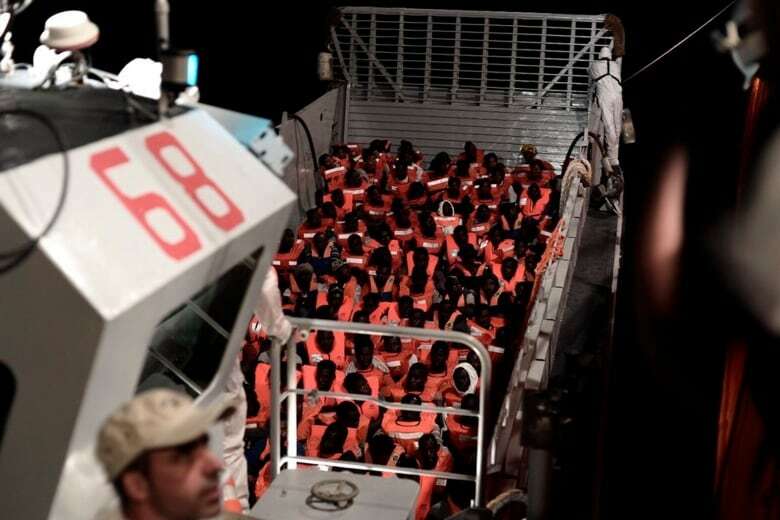 Also on Tuesday the U.S. navy and the aid group Sea-Watch rescued some 40 migrants off the coast of Libya. The U.S. Sixth Fleet, which is based in Naples, Italy, said in a brief statement the USNS Trenton "rendered assistance to mariners in distress that it encountered while conducting routine operations in the Mediterranean Sea." It said 40 people were rescued and given food, water and medical care on board the ship, which is often used for humanitarian aid and disaster relief. The navy statement didn't say where the survivors would be taken. The incident was first reported as a shipwreck by Sea-Watch, which said 41 people were rescued and 12 bodies recovered during the operation. "We really need more rescue ships," the migrant aid group said, in German, on Twitter.